Excellent new single from London trio Tender Trap finds band members Amelia Fletcher, Rob Pursey and John Stanley (DJ Downfall) in absolutely top form. Amelia is arguably the voice of the indiepop generation, fronting legendary acts Talulah Gosh, Heavenly and Marine Research from the mid-80s to the turn of the century and adding her unmistakable vocals to hits from The Wedding Present, Hefner, The Brilliant Corners, and Sportique, among others. Since forming in 2001 as Tender Trap, Amelia, Rob and John have released three singles and the superb album ‘Film Molecules,’ described in one respected music magazine as the “unholy alliance between Blondie and The Magnetic Fields.” The long-awaited follow-up, the ‘Language Lessons’ EP features lead track ‘Talking Backwards’ which will appear on a forthcoming Tender Trap album in early 2006. The song is a refreshing pop hit, full of chunky guitars, mellifluous vocals, smart drumming (courtesy of Claudia Gonson of The Magnetic Fields), ba-ba-ba’s and shimmering enthusiasm as it builds to its highly harmonious conclusion. The EP also includes three non-album tracks: ‘Unputdownable’ showcases more of Claudia’s ace drumming as it mixes lush string-filled verses with a shouty chorus that recalls the heady days of Heavenly’s P.U.N.K. Girl; ‘Friendster’ is a lovely ode to a certain online forum; and ‘Cómo Te Llamas?’ is a frighteningly catchy electropop hit featuring a bilingual duet between Amelia and special guest Lupe Nuñez-Fernandez of fellow Matinée superstars Pipas. 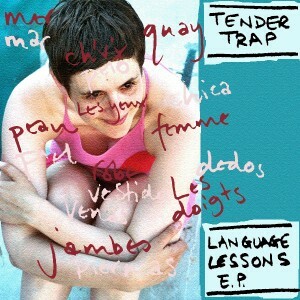 Another classic single and a very welcome return for Tender Trap! Limited to 1000 copies in custom minijacket sleeve.